When having dinner around a table, no one should begin eating until the person who has provided the meal (i.e., host or hostess) has been seated and has lifted his or her fork. Also, as a guest, I’m sure you want to compliment the hostess on the meal, and nothing speaks of true enjoyment like the spontaneous burst of pleasure after the first bite. What a shame for the person it should be directed to miss it because they haven’t been seated yet. So wait until your hostess – or host – has started eating themselves. When I think about this rule of etiquette, I have to give props to my dad who is the most loyal keeper of this moré. I see it at every family gathering, but mom says that even when it is just dessert in the den and only the two of them, he won’t begin eating until she sits to join him. It is a small, but noteworthy, gesture of appreciation he grants her every time they share a meal. This rule does extend to other settings – even if there isn’t a designated host. Don’t begin eating until everyone at your table has been served. This does not apply for multiple tables at large gatherings. You only need for your table to be served, not all tables. And, the hostess has some responsibility here as well. Don’t call guests to begin serving their plates if you’re not ready to sit with them. You should be aware that they are waiting for you, so don’t dawdle. 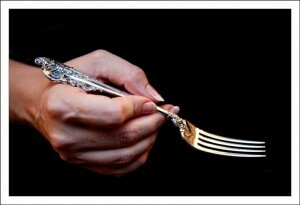 Waiting for your hostess to lift her fork makes for a great meal beginning!